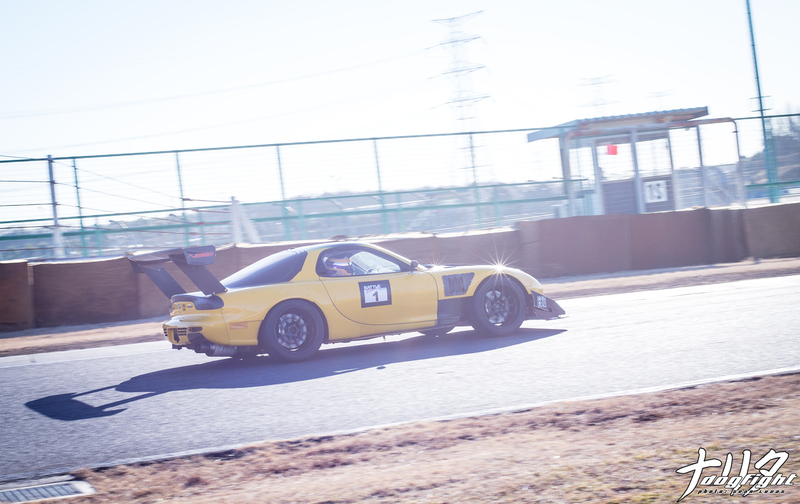 Last year I was able to chat with Ejima-san about the car he has built over the past several years, at his shop TFR, to compete in the sport of Time Attack. Just by being around him, I was able to get a feel for the type of person he is and how his personality ties into his driving. It’s a duo I’ve come to enjoy watching over the past events, and it’s nice to be able to revisit the build again this year. 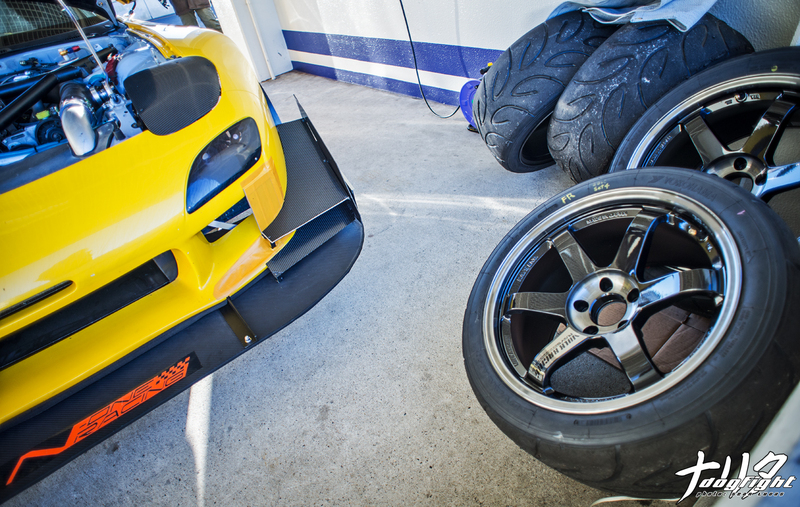 In the morning, I found the TFR FD sitting inside one of Tsukuba’s tight garage areas. Ejima wasn’t around, but I did happen to notice Takahashi-san, who wasn’t driving, but assisting with a few teams. 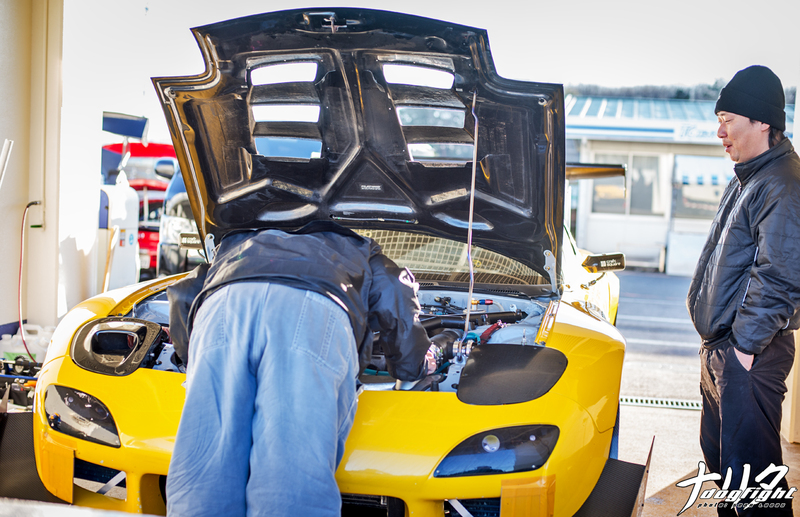 He was helping out Ejima by giving the car a once over before it was tasked to head out to circuit. 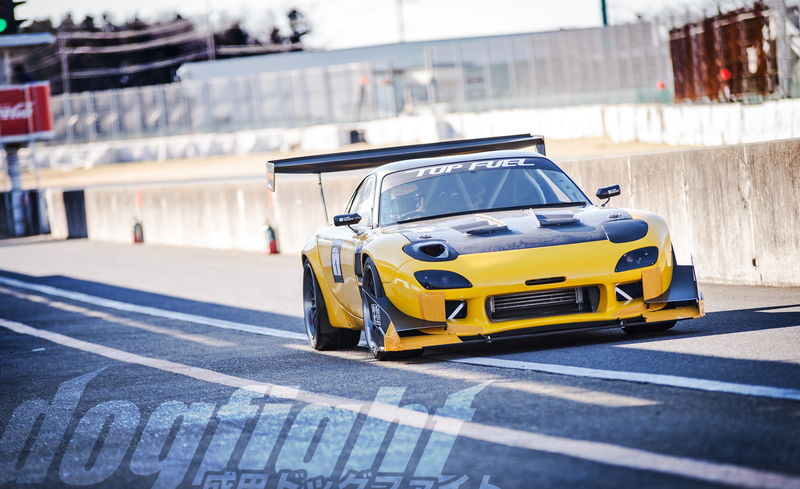 Takahashi is one of the greatest FD tuners in the country; that’s not to say TFR isn’t, but who wouldn’t want the second opinion of an expert for track prep? The set of 18″ TE37’s that would be run on the car that day sitting off on the side. The main set of wheels/tires were inside tire warmers to the side of the garage. The massive GT wing and rear carbon window from last year remained the same, with the addition of a very unique carbon taillight cover. 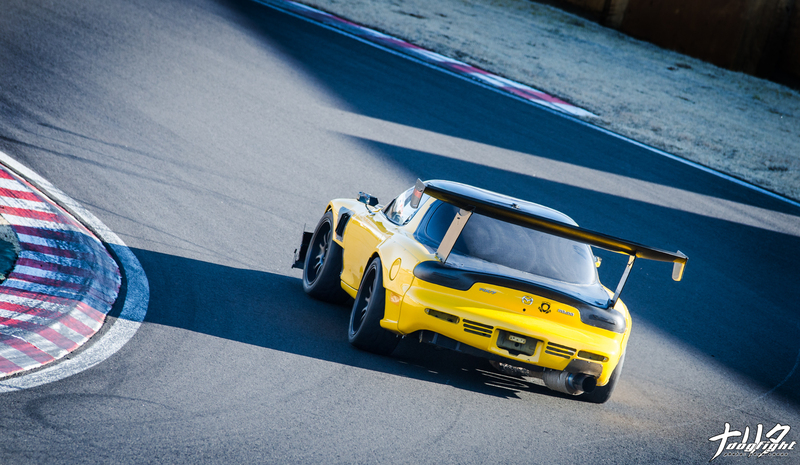 Out on the track, the bright yellow FD may be one of the quieter vehicles on track, but that’s definitely not to be mistaken for being slower. 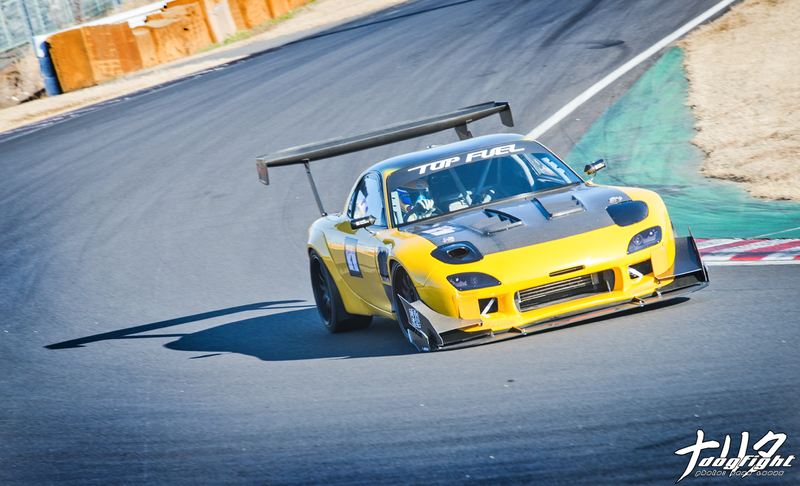 Last year he was able to garner a tremendously fast 56.398, just shy of the high 55’s that the Wacky Mate’s GTR32 runs. 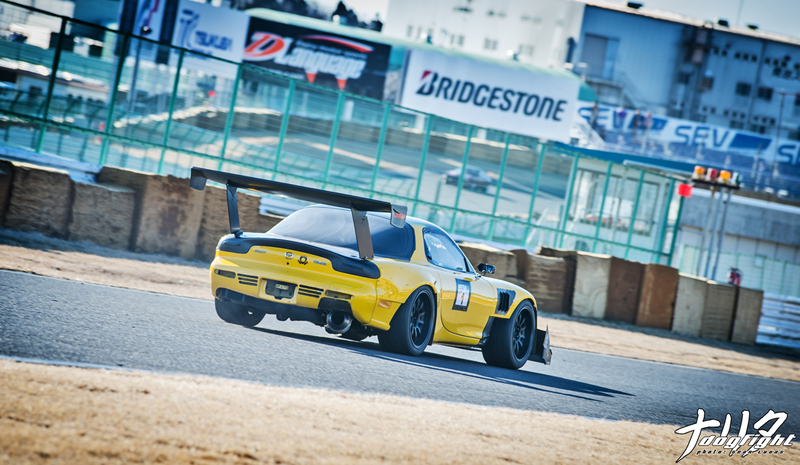 At this past year’s Battle Evome however, despite some minor changes to the FD, Ejima was only able to drive the car to a lap of 56.922; over a half-second shy of his personal best. While conditions may have been different, or a few changes didn’t quite work out, I’ll be happy to see this car out again next year to try again. Grab this still in hi-res in the wallpaper section!